A former governor of Ogun State and aspirant to the national chairmanship seat of the Peoples Democratic Party, PDP, Otunba Gbenga Daniel, has affirmed that his ongoing case with the Economic and Financial Crimes Commission, EFCC, will not affect his effectiveness if he emerges the party boss. 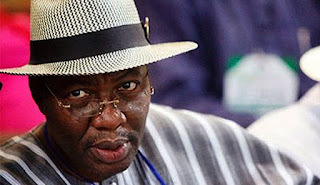 Speaking to newsmen after collecting his nomination form for the post at the party’s national secretariat in Abuja yesterday, he also decried what he said was persecution against him and other PDP members. Daniel also added that he could not be said to be guilty until a competent court pronounces him so. Initially reluctant to speak on the matter, he said: “I don’t want to talk about my trial. People call it prosecution, I call it persecution. “But I think there are a few things that are instructive. This trial had been going on for the past nearly seven years. I have been to court probably 40 times. “It is prosecution that is still prosecuting but they still have not finished presenting their case. I think that is instructive. “In as much as I don’t want to talk about it, the only thing I want to say is that according to the Nigerian Law and constitution, a person remains innocent until pronounced guilty or otherwise by a court of competent jurisdiction.